The item A fairy-tale ending, Jack Heckel, (ebook) represents a specific, individual, material embodiment of a distinct intellectual or artistic creation found in Charlotte Mecklenburg Library. 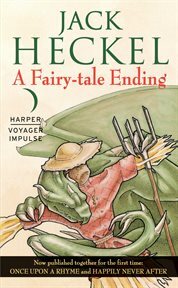 Collected for the first time, A Fairy-tale Ending comprises two volumes of Jack Heckel's Charming Tales: Once Upon a Rhyme and Happily Never After to become the first full novel in the Charming Tales series. Prince Charming had one destiny: to slay the dragon and save the princess. Both have been achieved, except there's a problem: Charming had nothing to do with either. A farmer named Will Pickett succeeded where royalty had failed-and this simply will not stand. Thus begins an epic adventure that has Prince Charming and Will Pickett vying with each other for the throne by challenging trolls, outwitting scoundrels, and facing all manner of fairy-tale creatures. All the while, a dark sorcery envelops Castle White, and Will's sister Liz and her friend Lady Rapunzel uncover a threat to the kingdom. The fate of Royaume hangs in the balance as Charming tries to salvage his reputation, and the clock is ticking..